Yarrow Makeup Remover and Cleansing Oil gently removes dirt and grime from your face without drying. Stop waking up with yesterday’s makeup on your face. This gel-like oil cleanser can remove the toughest makeup and skin impurities (really) without drying the skin. Gentle and non-comedogenic, Yarrow Cleanser uses light oils and contains extracts of yarrow and red clover. Apply 3-4 pumps to dry fingertips and massage over dry face and eye lids. Wet face and massage into a lotion. Rinse off or remove with a wet washcloth. Pat dry. Pomegranate Seed Oil – rich in anti-oxidants, anti-inflammatories and phytoestrogens to help repair sun damage and restore barrier function as well as protect skin thickness and relieve dry skin. Grapeseed Oil – a light, emollient oil great for sensitive skin, rich in linoleic acid to protect the barrier function of skin. Red Clover Extract – anti-inflammatory, antioxidant, rich in phytoestrogens to sooth skin and support the skin barrier. Yarrow Extract – anti-inflammatory, antioxidant, calming, cleansing. 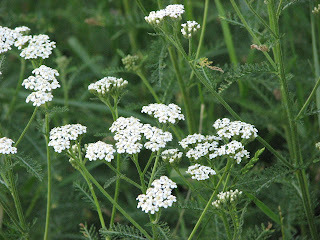 Yarrow is a wildflower that grows in the west. It is known to contain saponins that help cleanse. Caprylic/Capric Triglyceride (Coconut Oil), Vitis vinifera (Grape) Seed Oil, Helianthus Annuus (Sunflower) Seed Oil, Polyglycerol-3 Beeswax, Polyglyceryl Oleate, Prunus Amygdalus Dulcis (Sweet Almond) Oil, Olea Europaea (Olive) Oil, Cetearyl Alcohol, Simmondsia Chinensis (Jojoba) Seed Oil, Trifolium Pratense (Red Clover) Extract, Achillea Millefolium Extract, Cetearyl Olivate, Sorbitan Olivate, Punica Granatum (Pomegranate) Seed Oil, Oryza Sativa (Rice) Bran Oil, Roamarinus Officinalis (Rosemary) Leaf Extract. I love this makeup remover. It works great and my face feels so clean!